Many, many years ago, when I didn’t know any better, I would take my beagle to the Dairy Queen for an ice cream after every visit to the vet. She wouldn’t get just a “lick”, she would get her own kiddie cup! I would never do that now. Now-days, I do give my dogs sweet bites of apples, bananas, melons… they absolutely love them, but I would never give them something with all the added sugar as in ice cream. What happens when we consume more sugar than our bodies can use? Obesity, dental issues, hormonal imbalances, diabetes. What happens when dogs consume more sugar than their body can use? Obesity, dental issues, hormonal imbalances, diabetes. Done. End of blog. Just kidding… It’s true that our bodies respond to the overindulgence of sugar in a similar way as our canine friends, but that’s not the whole story. Technically, sugar is not bad for dogs because it is a carbohydrate. Carbohydrates are needed to supply energy, or fuel. We need a certain amount of sugar to fuel many of the processes in our bodies, like thinking, even breathing. I must mention though, it has been argued that our dog’s digestive system was adapted to eat flesh and fat which contain no carbohydrates. Instead of using carbs to fuel their processes, their body has the ability to break down protein to produce the sugar needed for energy. Regardless, sugar is the end result. Let’s discuss the difference between a healthy and a ‘not so healthy’ carbohydrate and what we should be feeding our pups. There are two types of carbohydrates: Simple, and Complex. A simple carb is pretty much just plain, refined sugar in any form… Cake, candy, ice cream. It’s the unhealthy stuff. A simple carb rapidly increases or “spikes” the body’s blood glucose level. A complex carb contains starch or fiber, like in whole grains, vegetables and fruit. A complex carb eliminates the sugar spike by slowly increasing the body’s glucose level over a longer period of time. It’s the healthy stuff. It gets kind-of confusing, though, because some complex starchy carbs are actually processed by the body as if they were a simple carb: White rice, white flour, pasta…. These are “high glycemic foods”. The key to knowing the difference between what could be harmful and what is not harmful is knowing a food’s glycemic index. The glycemic index is a numerical index that ranks carbs based on how quickly the body will respond or process the food. A high glycemic index indicates that the food will break down in the body as a simple carb whereas a low glycemic index will be broken down more slowly. For example, white bread has a glycemic index of 70. Green beans have a glycemic index of 0. We should avoid foods with a higher glycemic index. So what’s that have to do with our dogs, you ask? Often times, fillers in dog food contains too many high glycemic foods: corn, rice, white potatoes, wheat. This is one of the reasons the “grain free” diet is so popular these days. The grain-free diet contains more protein and animal fats, and fewer carbs. Animal protein is more easily digested by dogs. One argument by grain free diet supporters is that dogs do not really need carbs in their diet. They allege that since a dog’s body is not designed to break down carbs for energy, any carbohydrates consumed are simply stored as unhealthy fat. There is a lot of research published supporting both sides of the grain free diet “controversy” with convincing arguments on both. Do Dogs have a Sweet tooth? It has been suggested that dogs have developed a taste for sweets over the years as we humans share our food with them. Some researchers will go so far as to provide a scientific analysis of a dog’s taste buds in an attempt to prove that dogs cannot taste sweet. Others are overwhelmingly convinced – scientifically or otherwise – that dog are attracted to sweets. Sadly, one significant clue that our dogs have a sweet tooth is the number of dogs poisoned by antifreeze each year. Thousands of dogs die per year from accidental poisoning by antifreeze. Why are dogs attracted to antifreeze? Because it’s sweet! Dogs are as individual as we are. I could eat sweets all day long, but my husband has very little attraction to sweets. Just like us, some dogs may prefer savory flavors as opposed to sweets. Sugar is not only deliciously palatable, but it causes our brain to release dopamine, a “feel good” chemical. The same is true for dogs. It’s kind of a “sugar-high”. Why wouldn’t dogs want that feeling too? Once you start eating sugar, it’s really hard to quit, much like an addiction. One article online cautions that some mass-produced dog food manufacturers have actually added sugar to their food in order to create an addiction! Their intent is that your dog will refuse to eat anything other than their food. Can you believe that? As mentioned, the same things that happen to us when we consume too much refined sugar can happen to our dog too. Diabetes, obesity and tooth decay are just a few of the consequences. Since 2011, diabetes diagnoses in dogs have increased by 32%. Type 2 diabetes in dogs can be caused by eating too many carbohydrates. Excess carbs will turn into sugar, and excess sugar leads to diabetes. Likewise, type 2 diabetes can also be caused by obesity. That’s right… too much sugar makes you fat, and obesity leads to diabetes. Did you know that 56% of dogs in the US are overweight? I’m sure there are many factors at play (i.e., lack of exercise, perhaps poor-quality food, etc. ), but could one of the reasons our dogs are ending up with diabetes because we are feeding them too much sugar? If our dog’s body is unable to use and store sugar effectively, it will affect many other bodily functions as well. His energy level will not be optimum. Muscle tone may decrease. Immunity and the ability to fight disease may be compromised. Digestion suffers because sugar upsets the balance of bacteria needed to digest food, which can lead to diarrhea and vomiting. Excess amounts of sugar cause inflammation throughout the body. Inflammation can cause arthritis, dermatitis, pancreatitis, to name a few. Lastly, sugar produces an acidic environment in the mouth. Acids cause tooth decay and dental disease. I would be amiss not to talk about artificial sugars. One in particular: Xylitol. Xylitol causes a rapid drop in blood sugar in dogs and/or liver failure, which is fatal. Xylitol is sneaky too…. it shows up sometimes where you least expect it: yogurt, toothpaste, all kinds of candy, sugar-free gum, and even one of our canine’s favorite foods – peanut butter. Other artificial sugars, like aspartame, sucralose, and saccharin are not poisonous to dogs, but I would certainly caution against sharing them with your dog. There have been some reports of aspartame poisoning online, but most of these stories have been poo-pooed by veterinarians. So if your dog suddenly slaps up some spilled aspartame-sweetened diet soda, there is no need to panic. It’s just not a good idea to allow them to have artificially sweetened foods. These sweeteners are really not healthy for us, so why would they be healthy for our dog? Last night my husband and I were having dessert when Rex started doing a dance at my feet. That means he wants some of what I am eating. Instead of giving him cake, I gave him a fresh green bean that I had picked up from the market earlier that day. He was totally pacified and happily trotted off to the living room with his “special treat”. My beagle really didn’t need an ice cream to make her feel better after going to the vet either. She would have been perfectly happy with a healthy treat. The truth is, there is just no need to give our dogs refined sugar in any way. It’s perfectly fine to share foods with them that contain naturally occurring sugars (grapes and raisins excluded*). Because of the higher glycemic index of some fruits and vegetables, limit your pup to small bites, just as you would limit any type of “treat” for your dog. Our dogs are at our mercy. They eat what we give them to eat. Of course, we want our dogs to be healthy. We shouldn’t feed them things that could potentially harm them. At Holiday Barn Pet Resorts, we are careful with what we feed our guests. It is preferable for your dog’s health to bring his food and treats when he stays with us so that he does not get an upset stomach by the change in diet. We offer seasonal cookies and “furrmazing feasts,” free of harmful sugars and other ingredients. On occasion, we may offer – with your approval, of course – special treats like watermelon or hot dog bites! Check your dog’s food and treats to be sure sugar is not listed in the ingredients. 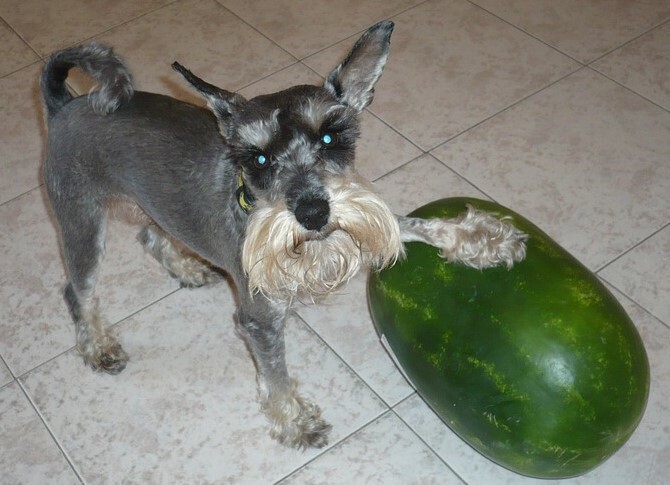 If you want to do something special for your pup, feel free to give him small bites of melons, berries, bananas, carrots, green beans, etc… He will think it’s the best thing ever! Let’s nourish our pets with nutritionally optimal foods so we can keep our little ones around for as long as possible! *Grapes and raisins are toxic to a dog. Error: Error validating access token: Session has expired on Monday, 29-Oct-18 09:08:51 PDT. The current time is Thursday, 18-Apr-19 19:24:49 PDT.